See Register an NCBI BioProject History. Prior to submitting massively parallel sequencing (MPS) data to NCBI, you want to register (1) your project and (2) those samples involved in a given project. 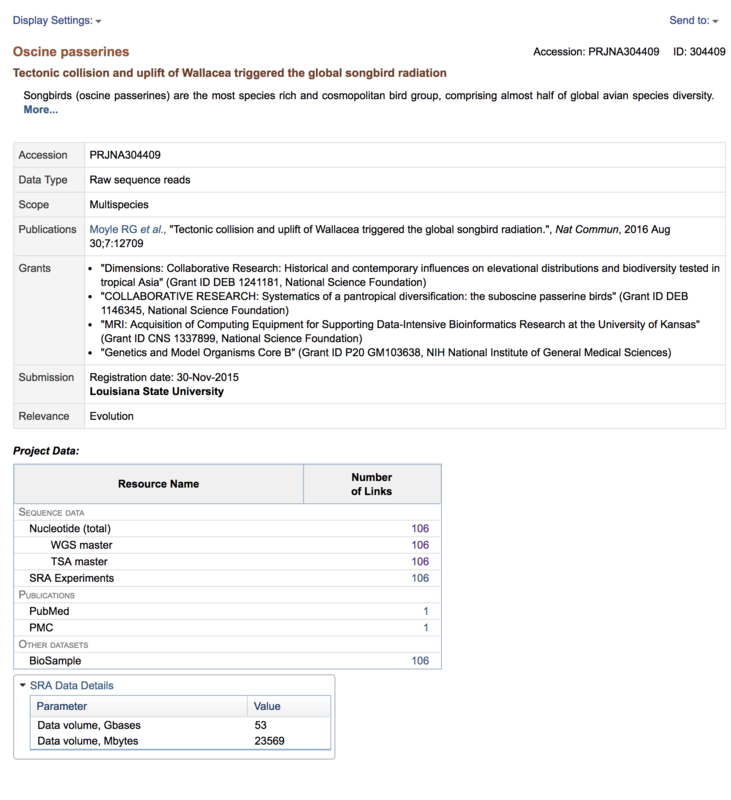 Registering an NCBI BioProject. is the first step of this process. You can also register a BioProject before you plan to register your samples or upload your data. That said, our laboratory policy is to upload all the data, all the time prior to publication (and usually prior to making a paper available as a pre-print). Click on the New submission link. The Submitter info should automatically be filled in using info from your profile. Verify the info and click Continue . On the Project type tab, select Raw sequence reads under Project data type and Multispecies under Sample scope. Click Continue . On the Target tab, fill in descriptions for Organism name and Multispecies description . Click Continue . Organism name can be a general description of the class of organisms (e.g. “Oscine passerines”). On the General Info tab, provide a Release Date , a Project Title (which could be your manuscript title), and Public Description (which could be your manuscript abstract). Select Evolution under Relevance. Under this tab, you can also add grant numbers and titles for grants that contributed to the project. If you are supported by NSF or NIH, please add your grant numbers and titles here. Click Continue . On the BioSample tab, do not enter any information (we will deal with this for multiple samples as part of [[Register NCBI BioSamples for a BioProject]]) and click Continue . On the Publications tab, provide the DOI of your manuscript, if available. Click Continue . 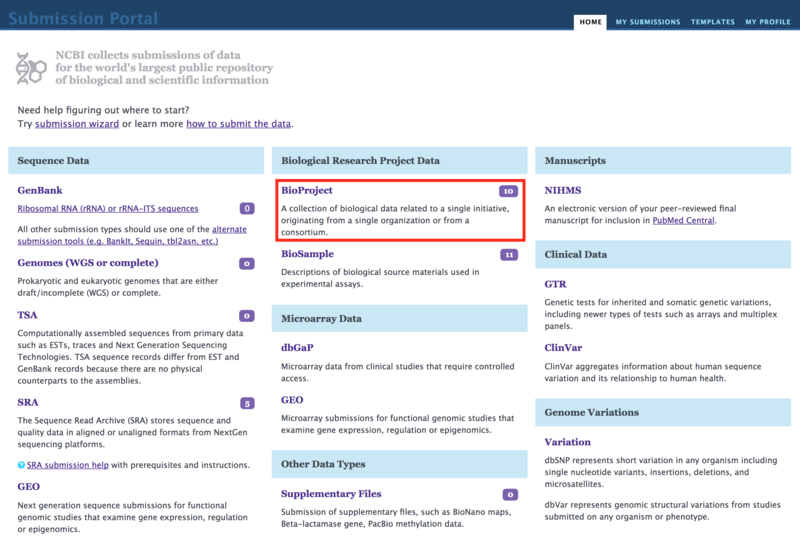 This BioProject page provides links to ALL NCBI resources related to your BioProject - making the BioProject a one-stop-shop for all of your project sequence data.